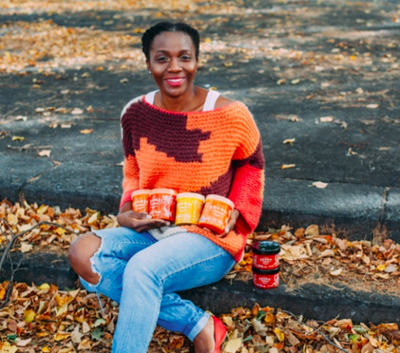 Our third feature in our Women’s History Month Series is Yemisi Awosan, the founder and CEO of Egunsi Foods, a Harlem-based food company that focuses on producing locally-sourced refrigerated African food. Although they now focus on their individually packaged farm-to-table soups, Egunsi Foods still offers catering through FoodtoEat and is the perfect option if you want to try something new for lunch and introduce your office to a flavorful and unique cuisine! I started Egunsi Foods in 2014. In order to see if there was any interest in West African food, I started testing out the market, offering my services through catering and as a personal chef. Once I found that there was an audience for this cuisine and that my idea was validated, I was able to create an extended product line that is now sold at Whole Foods Market, Fairway Market, on FoodKick and Goldbely in New York City. My inspiration is to tell/share the story of my Africa, my culture through it’s food. I partner with farmers in West Africa to source their raw materials for Egunsi’s final products. My philosophy is to actively give back to African farmers and create a long-term impact through social entrepreneurship rather than a short-term donation through philanthropy. The biggest lesson that I’ve learned is that you will be the most passionate about your vision for your business. But you have to find ways to have others buy into that same vision that you have; and it may not be at the same level as your passion, but you need to find people that fall somewhere around that neighborhood and understand and appreciate your product. I think being a female business owner has impacted my business in that I have to be extremely detail-oriented and super organized because I have to wear many hats as I run my business. I believe that the FoodtoEat mission is important because they create the platform that supports the mission. They are providing the opportunity that allows the mission to be actionable. Go after the dream(s)/goal(s) that you set for yourself. You don’t want to look back years from now and wish that you could have gone after them. Even if it doesn’t work out or if it doesn’t work out as you envisioned it, at least you tried and gave it your all. So no regret- I live by this philosophy.